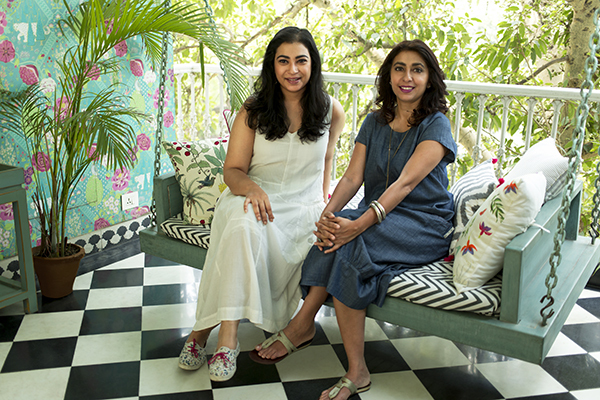 Today’s feature is on newly launched Indian lifestyle brand Nicobar, a home decor and fashion brand taking India by storm. 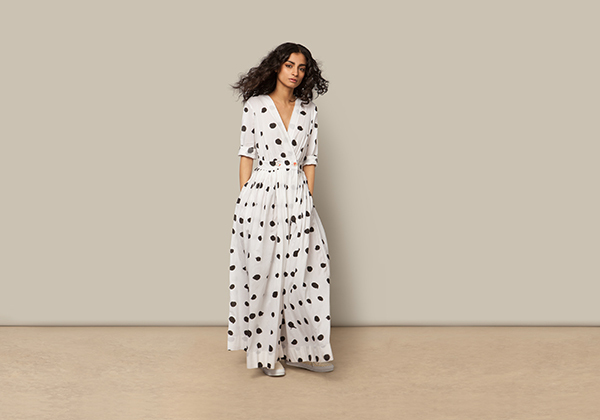 Nicobar has just celebrated its first 100 days in business, but this lifestyle brand is already capturing the attention of international audiences with their use of beautiful natural materials and modern silhouettes. Nicobar was founded by Simran Lal along with her husband Raul Rai. 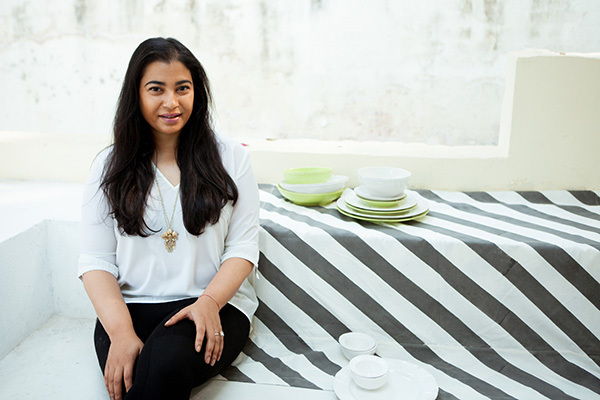 Simran’s experience in the lifestyle industry began with her role as CEO of Good Earth, a long-standing cult brand in India recognized for reviving authentic Indian craft in luxury design. The success of Good Earth motivated Simran to launch another lifestyle brand with a contemporary feel, while still maintaining the essence of India. This brand was Nicobar. 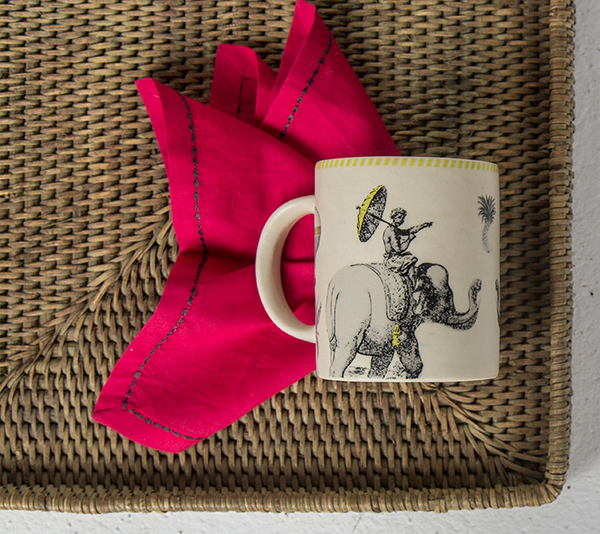 Hathi Mug illustrated with India’s history and tropical landscapes. If you’re wondering how they chose the company name, there’s a story there. Nicobar are a set of islands in the Indian Ocean known for natural beauty and relaxation. The Nicobar brand was inspired by the Indian Ocean, the Spice Route, and a relaxed island aesthetic. This relaxed island inspiration is at the center of the Nicobar brand. 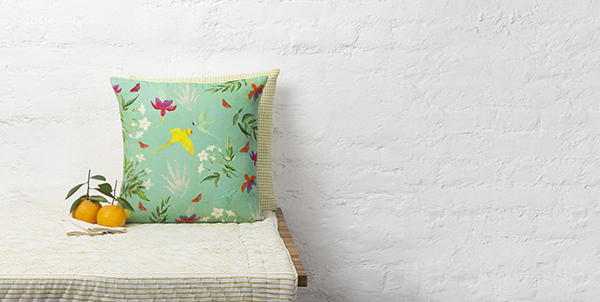 I absolutely love Nicobar’s refreshing home collections. The designs are unique and contemporary, yet grounded in traditional Indian design with pops of natural elements like wood and marble. Co-founder Simran Lal comes from an entrepreneurial family and watched her mother launch Good Earth. Good Earth has now been a thriving and well known company in India for over 20 years. Simran’s experience and appreciation for Good Earth motivated her to create something new and fresh – Nicobar! 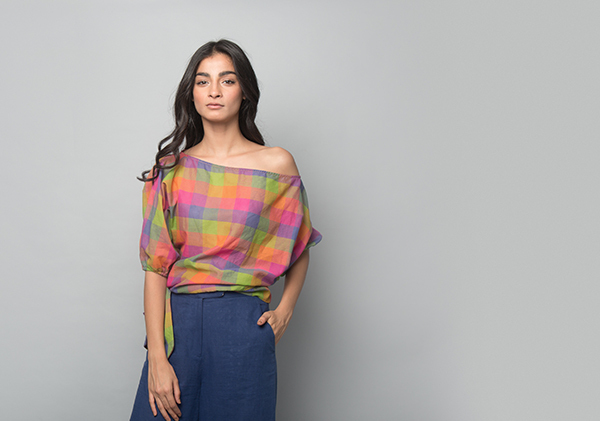 Her interest in art history, Indian’s rich cultural heritage, and old world and natural textile processes have all become intertwined into Nicobar’s modern brand. Nicobar blends old world craft with contemporary style by utilizing these old world processes that have been around for centuries, such as weaving handloom fabrics and creating fabrics printed with natural dyes. 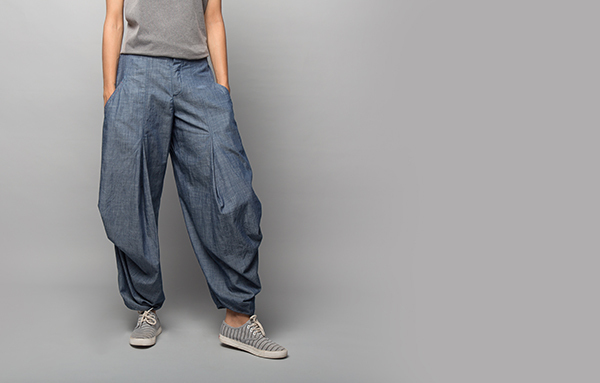 Also noteworthy is that all of Nicobar’s fabrics are natural if not handloom woven, which is actually totally on trend! 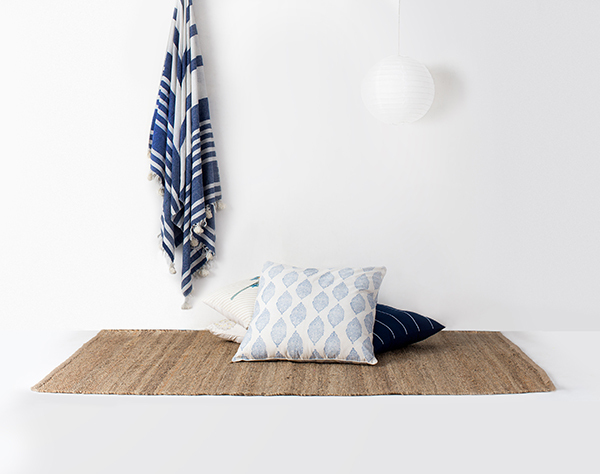 For the contemporary twist, Nicobar’s home decor and fashion collections utilize cotton, linen, and silk in Western silhouettes while maintaining an Indian identity. Cotton Tie Top shown in “multi checks” design. Although Nicobar is only a start-up, it is a company that has been 12 years in the making. Founders Raul and Simran are an amazing husband-wife business duo who each bring different skills and background to the table. Simran says that her husband has facilitated the hiring of a fantastic team, who have been instrumental in the building and launching of Nicobar over the last year and a half. Simran’s keys to success have been allowing for serendipity and taking time to plan for her upcoming week ahead of time. 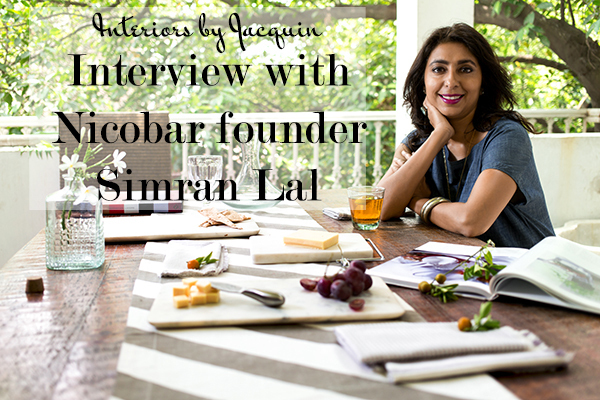 Most importantly, Simran and Raul took their time conceptualizing Nicobar as a brand. Now after starting their business digitally and having been in business just over 100 days, Nicobar has already opened several thriving stores! 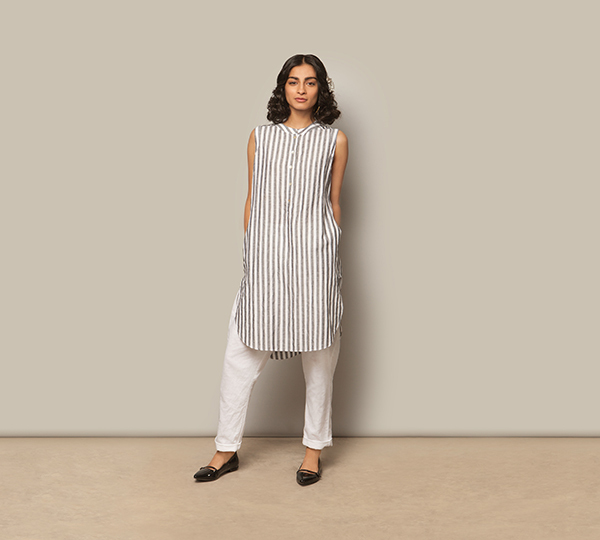 Striped tunic in linen-cotton blend. Simran describes the Nicobar studio as always buzzing like a beehive. There is no typical day and not a dull second. One moment Simran is discussing fabric and product development, the next she’s mentoring younger employees and handling business matters. When it’s time to develop new collections, Simran builds creative mood boards to inspire each season, utilizing global locations, unique fabrics, and fine art as the foundation for new collections. One of Simran’s favorite work activities is fabric hunting. Simran also regularly goes on factory visits and is always looking for ways to assist her employees and improve Nicobar’s products. 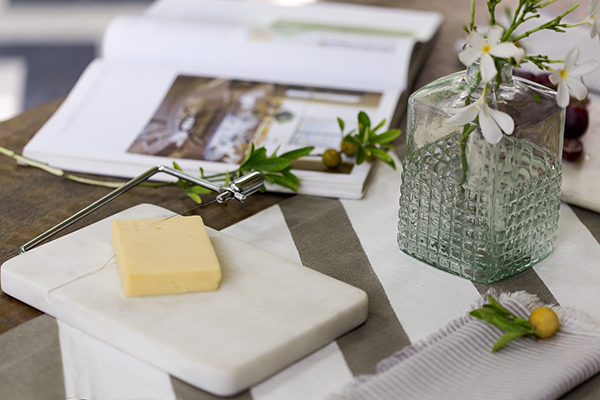 One sign of great design is being able to fill your home with your created items while achieving an elegant and relaxed look. 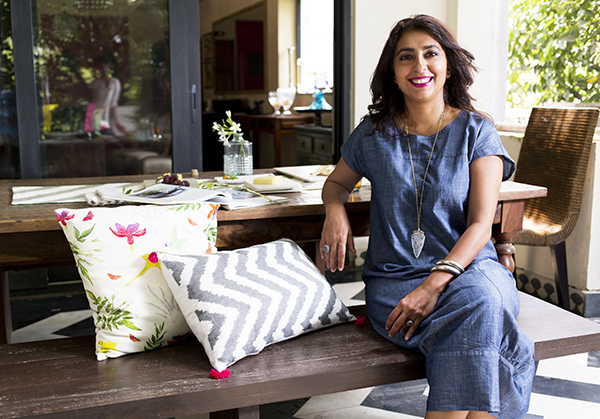 Nicobar’s founder and Creative Director Simran Lal allows us a peek insider her home, which holds special Nicobar elements throughout. 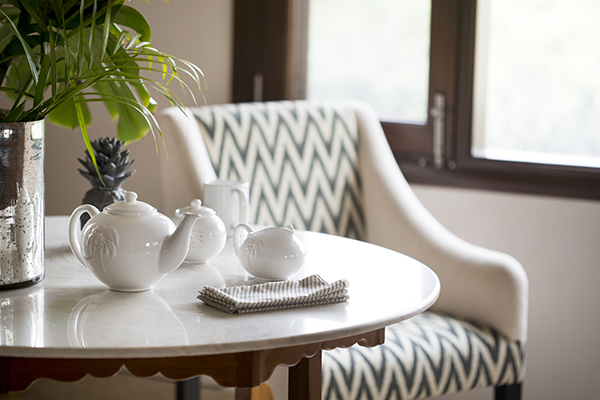 As you continue to read you’ll also find a few photos of the lovely home of Arya Nerker, the (former) Head of Design for Nicobar’s Home Decor. 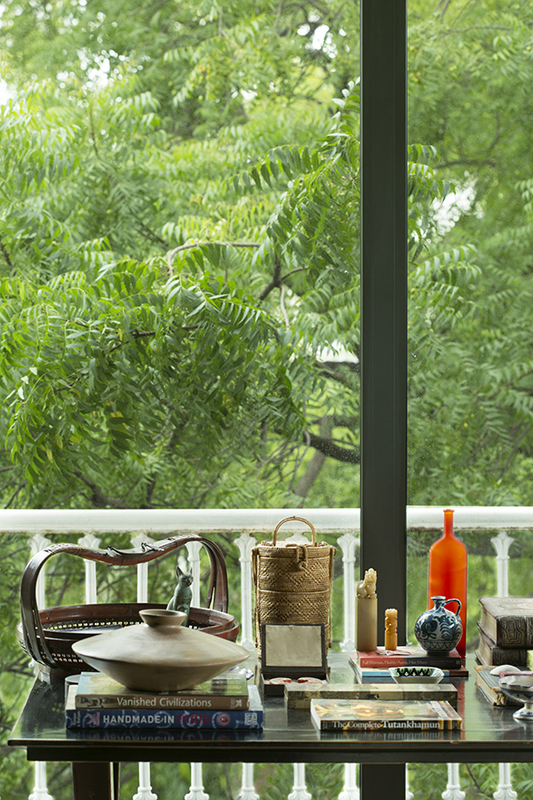 Home of Nicobar Founder, Simran Lal. 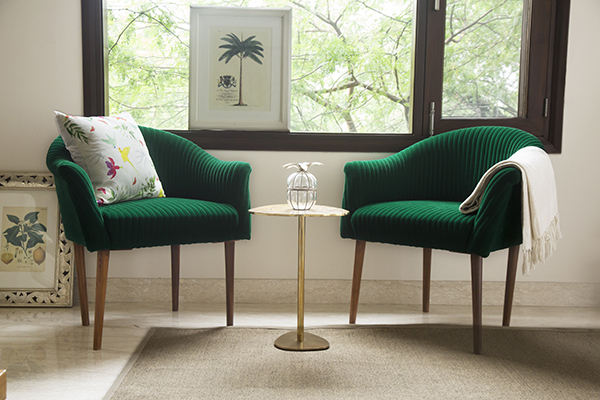 I also had the opportunity to speak with Nicobar’s Head of Design for their Home Decor department, Arya Nerker, who shared a bit about Nicobar’s design process. Arya notes that Nicbor as a company takes a very collaborative approach toward designing new collections. Their team often selects a global location of interest as the base for each collection, such as Gujarat and the Zanzibar spice route, two of their current design inspirations. 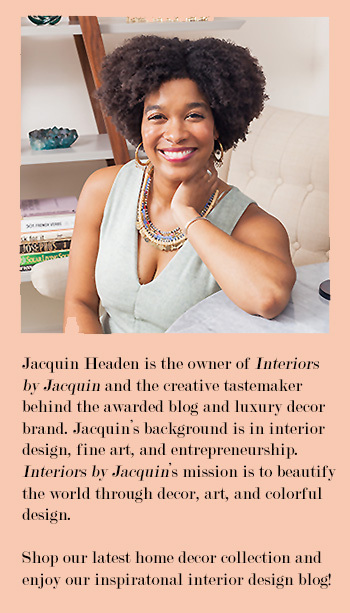 Then each department interprets the global inspiration to develop contemporary home decor and fashion designs. They research the history of the area they are featuring, for instance studying the intricate door carvings of Zanzibar, where many Gujarati individuals traveled to in Africa over 100 years ago. These antique wood carvings are done in a specific style and depict ancient history which Nicobar has introduced into their contemporary designs. Nicobar’s team refers to their amazing studio as “the tree house”. They work in a beautiful open-floorplan farmhouse about 30-40 minutes outside of downtown Delhi and their property has plenty of space filled with lush trees. Nicobar teams meet at the start of the day to determine a plan for the day. The home decor department tests prints on various fabrics, with Arya Nerker giving approvals. One or two times a week they sit with Simran and focus on the direction of larger projects. 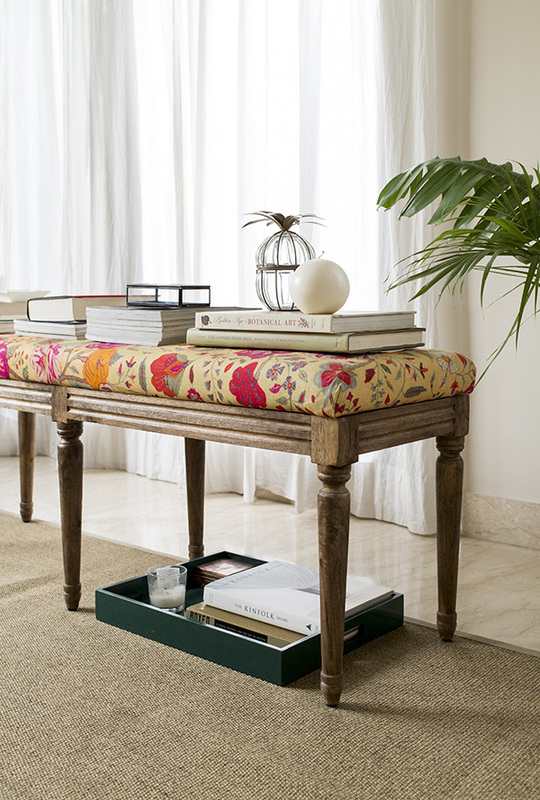 Simran and the Nicobar team also work to ensure that both the home decor and fashion collections are cohesive. The team is constantly making tweaks to their products until the very end of the production process. Nicobar’s open office plan really helps with making these decisions and determinations collaboratively. Jute table runner with silver accent and Andromeda Lota Vase in mercury glass. Marble Olive Boat, small and large sizes available. 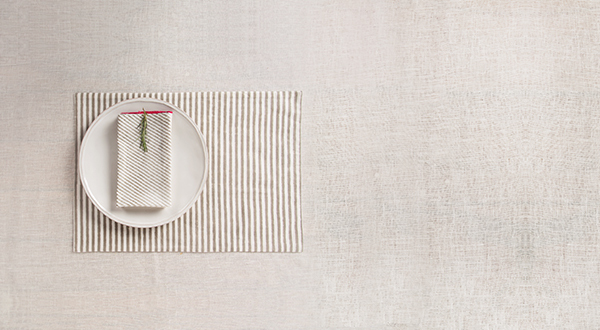 Stripes Placemats (Set of 2) and Verandah Stripe Dinner Napkins in soft gray. Nicobar’s mission is to enhance self-expression, and to make thoughtful pieces that customers will treasure, all while exploring the creative edge of rich Indian culture, and considering how it communicates to a global audience. Nicobar founder and Creative Director, Simran Lal (right) with Nicobar’s Head of Design for Home Decor, Arya Nerker (left). 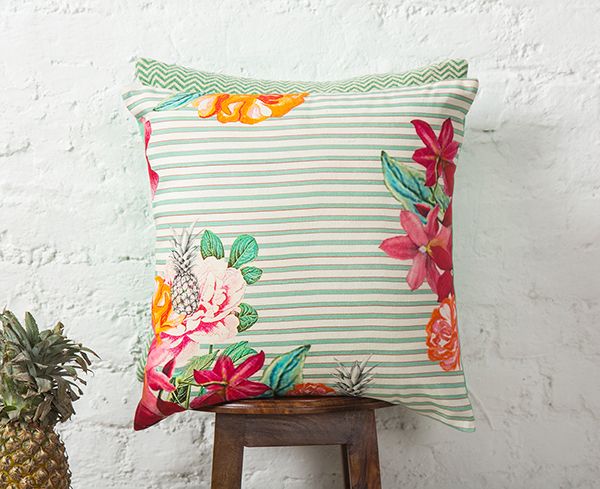 Verandah Botanical Cushion in Aqua. Nicobar has launched an impressive, globally conscious brand retailing truly unique home decor and fashion designs. If you love this fantastic brand as much as I do, you’ll be glad to know that Nicobar ships internationally. Visit the Nicobar website to enjoy more of their cutting edge designs.